Your child knows they're fast. Or at least that's what they claim after making you time them as they do laps around the living room... fifteen times. There definitely is a certain appeal to having the power of super speed. You could out-run the bad guys. Catch fleeing villains. Get wherever you want to go in the blink of an eye. That's pretty sweet. Not to mention, if you're like the classic DC hero, you've got the whole "speed force" thing with quick healing and crazy endurance. Did we mention running on water? Yeah, that's a thing. And, if you're like us, you're now daydreaming of how great it would be to pop down to the Caribbean for lunch and not have to worry about airfare. So hey, when it comes to superheroes, at least your minion picked a cool one: the Scarlet Speedster. 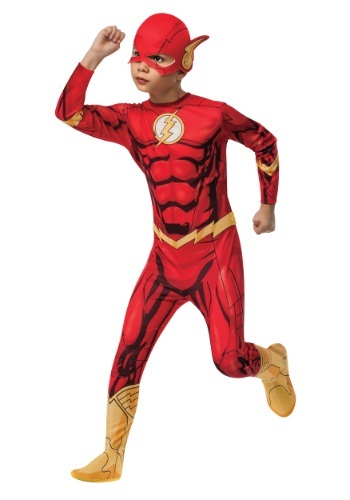 The Flash s such a cool hero option, we've got a scad of costumes for him. Consider this one, our Classic The Flash Costume. It's a full jumpsuit with iconic lightning bolt. There are yellow boot toppers and of course the recognizable mini lightning bolts for ears. Also note the epic shading for full muscle definition. Your kid will definitely look the part. Now whether or not they can make it around the couch in a fraction of a second is up to them.